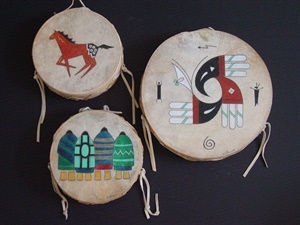 These drums are two-sided handmade leather hoop drums that can be used for drumming or for decoration. They can easily be displayed on a wall or on a shelf. Each picture is an original design by Linda Gould, developed and drawn to enhance the natural beauty of the drum. One side is left blank for drumming. The drums are made by the Tarahumara Indians from the Copper Canyon region of the Sierra Madre Mountains in northern Mexico. They are the largest and most isolated indigenous tribe in North America. The Indians are very nature-oriented and spiritual. To ensure the arrival of a good spring, drumming begins in February. At least one drum is sounding for 40 continuous days and nights. The night before Easter Sunday, all drums sound in unison and then go silent. Sheepskin covers both sides of the drum. They are laced together around a frame made of cottonwood. The laces and the blank side of the drum should be treated twice a year with a leather conditioner. Never put anything on the picture side. It has a protective UV and moisture resistant coating. There are a variety of of drum sizes, designs, and prices. For example: 7"=$35, 10"=$55, 12"=$70 plus shipping. A drum stick is included. Larger sizes and special orders are available. Content copyright by Desert Drums.